Come and stay at Möllstorp which offers you Öland's best sunshine and bathing opportunities and is the perfect base for excursions on Öland and in and around Kalmar. We are within walking distance of Öland's Safari and Amusement Park. 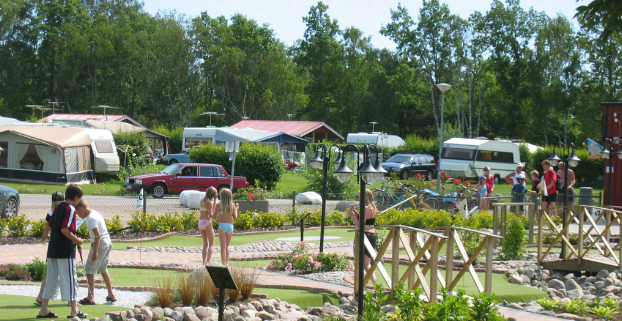 Möllstorps Camping is the perfect holiday location for all the family! Enjoy the beautiful, long beach and wonderful sunsets over the Kalmar Sound. Whether you’re seeking peace and quiet by the sea, swimming and games, experiences or evening activities, this is the place for you! Or how about a nice mixture of everything? The campsite has three fresh service buildings with free showers and toilets. There is also a kitchen with hotplates, oven and microwave as well as plenty of sinks. A modern laundry room is available. Our well-stocked shop sells most of what you could need for your holiday, and cups of coffee with tasty treats. The shop is located in connection to the reception with the same long opening hours. Ice cream is available in the kiosk on the beach. After a day on the beach, with lovely swimming in the Kalmar Strait, good food awaits in our restaurant, which has been under new management since summer 2011. A perfect place if you enjoy good food with sunsets and nightlife. In peak season we have entertainment several evenings a week on the stage by the outdoor restaurant seating. We have a bouncy cushion, two playgrounds, a climbing frame and our popular pedal cars for children. The whole family can play and compete together with adventure golf, football pitch, boule and volleyball. Long lovely beach with child-friendly shallow swimming and jetty. Special dog swimming.